Working from home offers many benefits, including extra income, flexible hours, and the ability to work in your pajamas. There are many ways to earn money online, but the real challenge is finding what's legitimate and what's not. 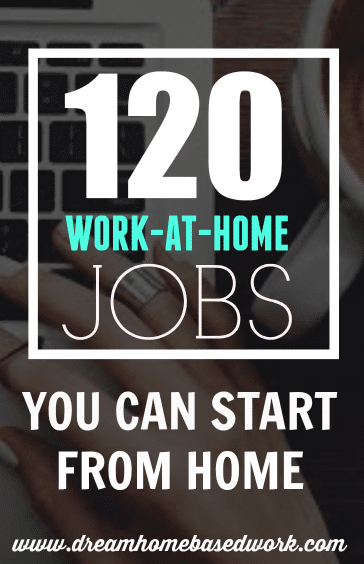 Here are 120+ work-at-home jobs you can start from home to earn extra income or even a living. Many small businesses and individuals hire people with secretarial and administrative skills to help them with day to day administrative, technical and social services over the Internet. Virtual assistants can provide a variety of services and charge more depending on their background, training and experience. You can earn money by picking up writing jobs at sites like Elance, Upwork, Textbroker,etc and earn a nice amount of money quickly on a regular basis. If you are proficient in SEO, you can earn more money with your writing service. ( See how you can start a freelance writing career with no experience). Today the Internet is filled with millions of websites. Many companies and individuals are in constant need of designing their websites to make them more appealing and functional to their targeted audiences. If you have a good knack for design, and have gained formal training, you can earn a decent amount of money with web design job. If you have a way with words, then you can earn money with copywriting job. You have to write persuasive content to promote products, services, brands etc if you want to be successful with copywriting job. A growing number of companies are hiring people for completing various admin tasks that can be competed at home. Administrative and clerical jobs include data entry, typing, basic accounting, etc jobs. You can do these jobs at your chosen hours and from your home or anywhere as long as you have access to a computer with Internet connection. Many small businesses and individuals cannot afford to keep a full time accountant or bookkeeper, so they hire freelancers on part time basis. If you are good at numbers, organized, and pay great attention to detail, then you can earn decent money by offering bookkeeping services to business owners to organize their monthly income and expenses. You can work as a virtual call agent from the comfort of your home if you have great customer services skills. Many companies hire home-based virtual call agents. You can earn money by selling beauty products and household wares to friends and neighbors. If you do not have your own products, then you can sell items of other businesses or individuals as an affiliate marketer via your own website, social media account, or a third-party website. Companies and individuals will pay you for writing reviews on their products and services. You may be asked to write reviews and publish them yourself on clients’ websites or your own website or blog (if applicable). You can also write reviews on some review sites and earn a certain percentage of revenue generated by your reviews. You can earn money by providing tutoring service to students and adult learners online. You need a good computer, high speed Internet connection, and a quiet place to communicate with your students or learners via voice or video, or a combination of both conferences. You need to invest upfront in website flipping business. The idea is to buy established and high-trafficked websites and enhance them to increase revenue, and then sell them at higher prices. Flippa is a website where you can buy and sell websites. You can earn money by selling grocery coupons online. You can find coupons from newspapers and resell them to make some extra bucks. You can also collect unused coupons from family and friends and resell them online (e.g. by listing them on eBay) or offline. One of the easiest ways to earn money is to take paid online surveys at legitimate survey sites. There are many companies that will pay you for giving out your honest opinions. Join as many survey sites as possible to increase earnings from paid online surveys. If you have excellent grammar and spelling skills, then you can earn a lots of money as an editor working for businesses and individuals across the world. There are lots of sites where you can find editing jobs, including sites like Elance, Upwork, etc. If you have excellent listening skills, and are a fast typist, you can transcribe audio tapes into written documents. Many businesses need help with transcribing services. You can earn money as a private tutor working from home. You can provide tutoring services to children, high school, and college students. If you are good at taking photos you can upload them at various stock photography sites and earn money each time someone buys your photo. You can set your own price at some sites. Some sites pay you each time your photo is downloaded by a user or customer. You can sell photos through your own photography site too. You can perform small tasks at site like Amazon Mturk or Fiverr, Fourerr, and more sites and earn quick cash pretty easily from the comfort of your home. You can provide answers to questions asked on sites like WebAnswers.com and Cha Cha by other users and people in general and get paid for your participation on the site. The more your answers are viewed the more you earn royalties. You need to have a Google AdSense publisher account to participate in earning program of the site. You can earn good money by selling products directly to people. Direct sales companies like Avon and Tupperware offer products that you can sell and earn money. If you have a sound knowledge of the social media networking sites and how to engage others by creating new conversations, answering questions, and solving issues, then you can build a great home based career working as social media marketer. Many people need help with writing their resume or curriculum vitae (CV). You can find resume writing jobs online. If you are good at using persuasive words and formatting a person’s education, work experience and skills in a professional and pleasant way, you can earn money by offering resume writing services. You can earn money quickly and easily offering your graphic design skills to businesses, webmasters, and individuals. Here are some sites you can look for graphic design jobs. If you have practical working experience in the financial arena, and have a strong background in finance, you can help individuals with important investment decisions, such as investing in stocks, real estate, retirement savings plan, income investing, and more. If you are able to manage a website’s forum or a forum website, you can make good money as a forum moderator. You need to be good at starting new conversations with people, resolving issues, approving comments, cleaning up the forum site from spammers. You can earn a lot of money working as a web programmer. If you have good skills in HTML, CSS, PHP, JAVA and SEO, you can assist companies and individuals with creating websites, fixing or revamping existing websites. You can write articles on a variety of topics and then put them up for sale on different article marketplace sites. Businesses and individuals will buy your articles if your articles meet their needs. If you have special expertise in a specific area, you can offer it to others who are looking for it. Whether it is career guidance, stress management, anger management, time management, or guidance in a variety of other areas, coaching people in a specific area is a great home based work or job option you can do all year round. If you love kids, then you can simply provide child care services to make some extra cash easily. Many parents are looking for this much needed service year round. If you have unused and unwanted items lying around your house, you can put them up for sale on eBay. Many people will pay good money to buy your unwanted items. You can sell your old cell phones online through various companies. You simply need to register with one of the websites where buyers check out for old cell phones. Some I recommend are Ebay, Craigslist, Swappa ( Android devices), and Gazelle. You can also sell your phone directly to local mobile shops that buy old phones. If you consider yourself an expert in a specific area or field, why not assist others who are in need of your expertise for a fee? Earn money as an advisor or consultant by providing solutions to people’s questions. If you are crafty, you can sell your handmade items via sites like Etsy, Art Fire, and Folksy among others. If you are you good at providing expert advice on many different issues, then you can provide expert advice on phone and email to people who need your service. You can check out sites like Ether and Cha Cha to make money by offering your expertise to customers. Some companies will pay you for a call handling service, i.e. just answering the phone. If you have a good telephone number, and can be at home to take calls all day, you can earn nice side income with this home based job or home answering service business. Many companies hire people with research skills to conduct research online about various topics. As an Internet researcher you answer questions that various kinds of customers text in. The more questions you answer the more money you make. Do you want to get rid of used clothes? Why not sell them on eBay, Craigslist, and at consignment shops for extra money. You can double win by getting rid of clothes you don't use while making money in the process. If you have a blog or social media account with a large audience or following, you can share various different deals offered by companies with your family, friends and your audience. These companies will pay you for promoting their deals, i.e. coupons. Escalate Media and Go Freebies are two such companies you can check out to get started. If you love to bake, you can turn your passion into a cake baking business from home. You can get customers from endless sources such as birthdays, baby showers, retirement parties, weddings, bachelorette parties, etc. If you are good at planning different events, you can make money by offering event planning services for weddings, birthday parties, baby showers, and more events. You can start a home-based franchise business with a low risk potential. There are endless opportunities in this niche. Choose a franchise business option, be your own boss, and make money. You can use your hairstyling skills to make money from home by cutting, coloring and styling clients’ hair from the comfort of your home. Make money by offering home staging services to home or property owners by de-cluttering, organizing and improving the appearance of their property before putting it up for sale. If you are a neat-freak you can offer house cleaning services to neighbors, friends, families, and other people in your local community or neighborhood. If you are a certified accountant or have good experience in accounting then you can earn extra cash by providing small businesses and individuals with assistance regarding tax preparation, filing, etc services. If you have filming and editing skills, then you can assist small businesses and individuals with creating various kinds of videos such as short films, commercials, and documentaries. You can make funny, interesting, educational videos and publish them on YouTube. YouTube’s partnership program will allow you to make money based on the views of your videos. You can earn good cash by selling your unwanted or broken jewelry. I have personally used Zales gold exchange and would highly recommend it to anyone. You can get paid while you shop online at cash back sites like Ebates. These sites give you cash back for each purchase you make through their sites. There is a high demand for people’s hair that has not been chemically treated. Your hair needs to be a minimum of 6 inches long if you want to sell it. You can charge more money if you have an unusual hair color. Contact your local hairdresser saloons or wig stores to find more information about selling your hair. Taking in foreign students is a very lucrative way to make a lot of money each week or month. You can contact your local universities and colleges to find out if you can offer to put up foreign students they have. You can advertise privately too that you have rooms to rent out. If you are good at researching various different travel deals, holiday or vacation ideas, cheapest fights, hotel accommodations, etc then you could consider working as a travel planner and offer travel planning services to people. You can deliver leaflets and some extra cash easily. Get in touch with your local marketing agencies or companies or takeaway firms to find this type of job. You can provide elderly care services to many families needing outside help to take care of their elderly loved ones. Services can include cooking, cleaning, etc. Many people are looking for a room for a night or two. If you are comfortable with accepting paid house guests, you can take in lodgers often and earn nice side income every month. You can earn some extra cash by working as an exam invigilator. This opportunity can be found on school websites or by getting in touch with the schools in your area in person. If sewing is your passion, you can earn additional money from home. You can make, alter, and stitch garments for individuals and earn good money. You can earn good money by starting a home based laundry business. You can include ironing service as part of the laundry business, or just provide only washing, drying and folding services. Many people would be happy to be your customers. Are you good at painting faces of children? Use your talents and make some cash. You can offer face painting service at birthday parties, amusement parks, carnivals, and more. You can create fashionable designs, e.g. t-shirt designs, and sell them through different websites like Etsy among others. There are sites like Slicethepie.com where you can listen to music and review it for money. The more and better reviews you can do the more you will be paid for each review. You can make different kinds of jewelry items and sell them online via your own online store or on Esty, or sell them to your friends, family, neighbors, and colleagues, or sell them through your home parties. You can make money working as a medical transcriptionist. You need to familiarize yourself with different medical terminology to do this job. Medical transcription simply refers to the process of transcribing recorded messages from medical professionals to written words or documents. You can help other people get in shape and earn extra money. You can help coach people in your home. You can also go to their homes, or offer online fitness classes through video chat or Skype. If you have a marketable skill, such as content marketing, SEO, traffic generation, etc, then many businesses and individuals are in need of your skill set. For instance, you can help businesses with converting the traffic their websites receive. Get rid of your used and unwanted items by putting them up for sale on eBay. You can sell pretty much everything and there is a huge market for used items online. Social media is a powerful online marketing tool today. If you have a good understanding of various different types of social media sites, then you can help companies and individuals grow their own following. You need to be an expert in creating content on these platforms, and engaging the audience. If you want to sell goods online, then creating an online store or shop is a great way to make money from your home. You can set up a brand new online shop via a hosted Ecommerce platform provider like Shopify or create one on your existing website by adding Ecommerce funStart an ctionality (e.g. shopping cart). You can offer corporate and/or individual assistance by completing various tasks like arranging meetings, purchasing tickets or gifts, paying bills, etc as a personal concierge. If you love to shop then why not you offer your shopping services to others who are busy? You can look for the best deals and then purchase items either online or in store for them. If you have a flair for fitness, then you can help others achieve their fitness goals (help them get fit and healthy) while making some extra money by offering your personal training to family, friends, and others. You can make money by being a personal stylist to help other women discover their own sense of style, using your knowledge. You help clients with revamping their appearance, new makeup, hairstyle, wardrobe shopping, etc. If you are good at taking photos, then you can use your talent to take photos of your family, friends, colleagues, kids, weddings, special events, etc for a fee. You can work as an independent real estate agent. If you have a pleasant personality, good communication skills, knowledge of the real estate markets and latest trends in the industry, this can be a good home based job for you. As a search engine evaluator, you will evaluate search engine results to determine if the search results are accurate, relevant to the keyword(s) typed in, timely, and spam-free. Sites or companies to check out for search engine evaluation jobs are Appen, Leapforce, Lionbridge, etc. If you have a lot of items to sell, you can raise a good amount of money at a yard sale. You need to consider a few things like what you have to sell, where you are selling your goods, the competition, the weather, and advertising if you want to hold a successful yard sale. You can earn a full-time living by selling your crafts online via websites like Etsy.com. There is a huge market for your handmade goods. If you love shopping for antiques, then shop for antiques, collectibles etc items and resell them on eBay, Craigslist or your own online shop for a profit. You can earn money by assisting the elderly people who need help with everyday activities. 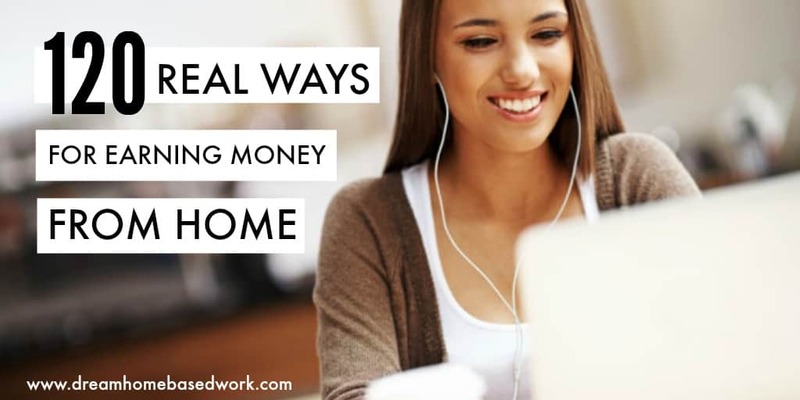 In addition to earning money, it can be a satisfying option. If you love spending time caring for kids then you could get paid to look after local children. You need to check what legal and safety requirements are there to offer all day or after school babysitting service. Renting your extra space in your home can earn you little nice cash every week or month. If you have a spare room or basement, you could take on a renter. You could grow fruit and vegetables in your own garden and sell your extra produce at farmer’s markets. If you have a tax background, or are willing to take training courses, then you can earn some extra income during tax seasons by offering tax preparation/calculation services. You can earn money from home by checking out websites better known as a website tester. What you do is to give feedback to the site owner by following their instructions. Basically, you tell them if the website is intuitive and easy to navigate. Many health insurance companies hire telephone nurses remotely to perform a variety of duties over the phone. Duties include case management, patient education, treatment authorization, etc. Check out sites like MedicalJobsOnline.com, Judge.com, and Medzilla.com to find the right position for you. Chances are you have a few boxes of books sitting around your house. Why not sell them for extra cash? You can also buy used books in bulk at discounted prices and resell them for a profit. You can set up a book shop and sell used books as well as sidelines like maps, postcards, greeting cards, etc. If you have experience, training and license, you can earn some good money as a hairstylist. It can be a popular and lucrative home based business. You can make some extra cash from home easily if you have the knowledge and talent for drawing, painting, etc creative arts, and teach others. You can offer technical support online or offline from home to customers who are experiencing a problem. If you have a background in IT, engineering or telecommunications, you can earn even an income as a technical support specialist providing you have advertised your skill to your targeted market. If you are organized why not help others organize their homes and offices for a fee? You can use your organizational skills to create more functional environment in homes and offices, resulting in increased productivity decreased stress. You can earn extra income by being an online juror working from your home. Your task is to review court cases that are filed in your local county or federal district. If you are good at creating designs for shoes, then you can sell them online, in your local boutiques or sell them directly to friends, neighbors, and other people. Hosting a garage sale is a great way to earn some extra money. You can sell everything that you do not need or want to use. You need to advertise your garage sale on your local newspaper, bulletin board, Craigslist, etc. You can also sell your items by hosting a virtual yard sale via the Yardsale app. You can earn several hundred dollars a month if you put ads on your car. Many companies are willing to pay you to put their ads on your car. Many people will pay pet groomers to bathe their pets and trim their hair. If you love pets, pet grooming is a perfect home based job for you. If you love animals and enjoy the outdoors, then pet walking is a great job that can earn you some extra money. You can be walking two or more dogs at a time to earn $15-$20 per hour per dog. If you have expertise in business, you can use your experience and skills to coach other business owners and managers to help achieve their business objectives. You can earn extra money easily if you have good computer troubleshooting and repair skills. You can offer computer repair service to your friends, neighbors, and other people in your community. You can reach out more people beyond your community over time. If you love receiving free products from brand name companies, why not get paid to test them for FREE. As a product tester you can earn as much as $120 to give your honest feedback, and best of all the products are yours to keep! You can grow flowers at your own garden or backyard if you are willing to spend time and considerable effort, and sell them to earn some extra cash. If you are a licensed massage therapist, you can earn money by providing in home massage and spa treatment. You can also offer chair massages at conferences, shopping malls, etc places. If you have a garden that you do not use, then you can rent it out to people who do not have one and wish to grow vegetables and flowers. If you have the right skill set, determination to succeed, you can consider doing work at home jobs listed above. You can do multiple jobs if you have the necessary skills. 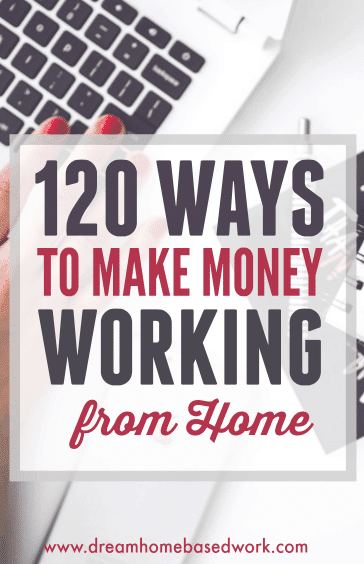 Work at or from home jobs are perfect for stay at home moms, dads, retirees, and students. Finding the right job and opportunity is key to your success. Such a detailed list. Thank you for sharing, Shay! This is great, thanks for all this. Thanks for the awesome list, Shay. I never thought about gardening as a home-based job, you’re so clever!